Watching closely makes you learn things, though. Things that maybe you don’t want to know, things that might ruin your idea of perfection about someone. In Tyler’s case, though, discovering certain things about Becky only makes him want to protect her. She’s unwanted, both by her parents and the boys that use her, ignore her and spread tales about “Becca,” the girl who doesn’t say no. But how do two people with such conflicting views of the same person ever get on the same page? Best Thang ‘Bout It: I love that the protagonist is a male. A guy with a huge attraction who can’t act on it. In fact, he can’t stand up to any of his relationships: his girlfriend, who got that position because he said nothing; his sister, who, while is supportive, is frank about how she thinks Tyler needs to run his relationships; and his friends, Robby and Justin, who act like court jesters but who express their opinions about his lack of fortitude with both his girlfriend and his obsession. This story just felt like real high school. Tunnel vision, letting life run you, not knowing how to handle hurt and big problems. Being a mess on the inside, being stupid, missing the obvious. Finding out that not everyone has a great home life. Discovering how much stuff people try to hide. I liked how Syd was portrayed; she really knew what she was getting into when dating Tyler, but she was willing to take a chance. Her reaction to their discussion in the park toward the end of the story is perfect. No stereotypical mean girls or histrionics here, either. All the female characters felt real; flesh, bone and brains. I’m Cranky Because: It just stops. Ends. No neat bow, no thanks for reading, no fiery car crash. Now, I don’t really mind the “‘nuff said” approach, but I felt like we were still on the on-ramp, and we were just getting ready to merge. Imagine being on a roller coaster on the biggest hill, climbing, climbing, and just before you reach the crest, it’s over. No apex view, no plunge. Damn. Also, this idea of Becky as the Manic Pixie Dream Girl? I can’t tell if it is being used ironically, since it’s a deeper story than that trope. (Unfamiliar with the term? Read about it at TV Tropes.) Where’s the wackiness? The freedom? The spirited behavior? The opening up of the stuffy male lead? I didn’t see it. The Bottom Line: MPDGs aside, it’s a good read that says “stop imagining; discover the truth instead.” But be ready for what you uncover. 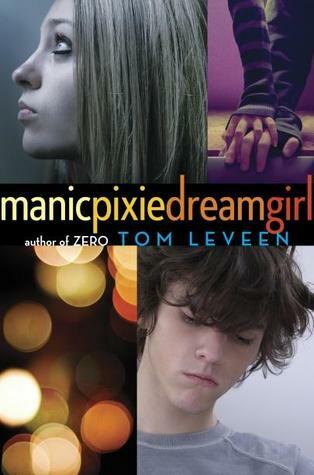 manicpixiedreamgirl by Tom Leveen was published April 23, 2013 by Random House Children’s Books. A free copy of this book was given to Ink and Page in return for an honest review. Big thanks to NetGalley, Random House Children’s Books and the Author. Thanks so much for linking to M’s review 🙂 I did LOVE the male narrator too, and YES, it did feel SO much like high school. (Do you do this thing where you picture books like your own high school? This happened here.) Okay, yes, the ending wasn’t… what I thought but I didn’t mind it and kind of liked that it ended up the way that it did. I think Leveen is like completely underrated and has just as great of a handle on voice as John Green does (in fact, I think his is better) and I just bought another one of his books yesterday afternoon. (Party came highly recommended.) Hope more people give Tom a chance! I will definitely read more of his books. I like a male perspective in young adult. I had a link in the review to a definition of the term. It was coined by a movie critic and described the female character that is basically a free spirit who draws the male protagonist out of his stoic, rule-abiding self. I am going to read another one of his books to see what it’s like. I’ll read Party, then.